Karachi Zebras eked out a one-run win over Federally Administered Tribal Areas Cheetas, dismissing the latter for 96 in a curtailed match reduced to 14 overs a side. Put in to bat, Karachi were boosted by a 56-run, third wicket partnership between Hasan Raza and captain Faisal Iqbal, which helped the side post a challenging 97 for 5. Raza top-scored with 45 off 36 balls. In reply, FATA were tottering at 5 for 2 before their middle-order batsmen got starts and kept the chase on track. A flurry of wickets with the side within sight of the target, however, cost the team a win. Shabbir Ali and Kamran Sajid took two wickets each as Dera Murad Jamali Ibexes beat Abottabad Falcons by 11 runs in a rain-shortened match in Rawalpindi. Sent in to bat after wet outfield conditions had delayed the start of the match, Dera Murad Jamali scored 35 for 5 in their five overs. None of their batsmen got into double figures, with Mohammad Ayub and Sanaullah top-scoring with 8 runs each. It still proved to be enough. Yasir Hameed struck two fours in the first over of Abbottabad's reply, but they only scored five runs in their next two overs. After three overs, they were 15 for 3, and needed 21 from 12 balls. Shabbir and Sajid, bowling the last two overs, dismissed four more Abbottabad batsmen. Needing 13 from the last over, bowled by Sajid, Abbottabad only managed 1 run. Chasing 167 against Sialkot Stallions in Islamabad, Larkana Cricket Association Bulls only managed 69 for 9. Only two players got into double figures for Larkana, as a side containing seven T20 debutants struggled to come to terms with a side boasting as many as eight players capped by Pakistan. Bilawal Bhatti took three wickets for Sialkot, while Sarfraz Ahmed, Raza Hasan and Abdur Rehman picked up two each. Sent in to bat, Sialkot scored 166 for 6, with wicketkeeper Shakeel Ansar making a 40-ball 54. Other useful contributions came from Haris Sohail, who made 34, Shahid Yousuf, who struck a 27-ball 39, and Ali Khan, who scored 20 off 12. For Larkana, Ghulam Yasin and Zahid Mahmood picked up two wickets apiece. Bismillah Khan's 41-ball 51 led Quetta Bears to a five-wicket win over Hyderabad Hawks in a 16-over-a-side game. Chasing 100, Quetta lost a few wickets in clusters but stabilized through small partnerships. Bismillah's 51 was the centerpiece of the chase with five fours and a six. Earlier, Hyderabad, who were put in to bat, lost their last seven wickets for 50 runs, sliding from 49 for 3 to 99 all out. 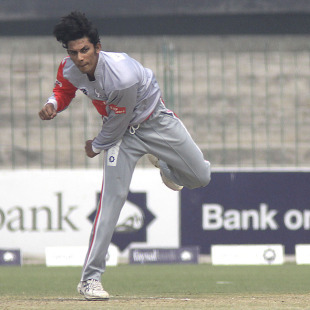 Left-arm pacer Nazar Hussain and Ghulam Mohammad picked up three wickets each, while Sher Ali took two wickets. Lahore Eagles' vaunted batting line-up, featuring Imran Farhat, Taufeeq Umar, Kamran Akmal and Azhar Ali failed to chase down a target of 119 against Islamabad Leopards, and lost by 17 runs. Umar struck a 45-ball 41 but had little support from the rest of the batsmen. Lahore's chase suffered a big setback when Umar, Azhar Ali and Ikhlaq Bhatt were out in the 15th over to Imad Wasim. Lahore managed to last all 20 overs, and ended their innings at 101 for 9. Earlier, useful knocks from Junaid Nadir, Faizan Riaz and Imad helped Islamabad recover from a top-order stutter and score 118 for 7. Mohammad Khalil was the most successful bowler for Lahore, taking 2 for 19 in his four overs.